It’s not unusual for pet-related stories to go somewhat viral, but an incredible tale from last week has gone viral globally—the story of how a newly rescued 2-year-old dog saved the life of they family’s 7-year-old girl, bravely and unwaveringly standing his ground against a formidable foe. Is it any surprise this dog is a German shepherd? To lovers of the breed, it’s just one more event that reaffirms what they already know. Haus, recently rescued by the DeLuca family in Tampa, Fla., was in his new back yard with young Molly when the two came across a venomous Eastern diamondback rattlesnake. The brave shepherd immediately realized the danger and placed himself right in harm’s way—and was bitten three times. Three times Molly would have been struck if he hadn’t acted. If only Haus were in the same condition. 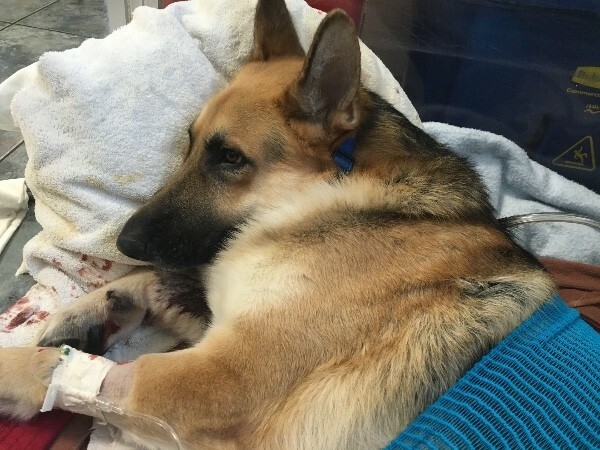 After the family rushed him to Connechusett Animal Hospital in Temple Terrace, Fla., he received lifesaving and expensive antivenom, but his recovery is far from over. The cost of treatment to keep Haus alive has already reached $10,000 and is expected to climb even higher. Friends of the DeLuca family have set up a GoFundMe page for anyone who would like to donate toward his care. The American Kennel Club defines the German shepherd’s personality as “smart, confident, courageous, and steady; a true dog lover’s dog.” Other adjectives regularly used to describe the breed include loyal, protective, alert and brave. But I don’t need to tell you that. If you have or have had a German shepherd share your life, you know deep down, without question, that he would give his life to save yours. Why are German shepherds always among the top 5 most popular breeds in the U.S. (currently it’s No. 2)? Because they are utterly amazing. Haus, this noble shepherd, barely with his family for two months, almost lost his life to save a little girl he had spent little time with yet clearly was fiercely bonded to. He knew what he had to do and without hesitation, he did it. Haus and his actions are why we love this breed … and why we’re not surprised that it was this breed that yet again saved the day.